IQeon is a revolutionary decentralized PvP platform providing easy ways for gamers to monetize their in-game achievements. The startup is also stuffed with open SDK facilitating the development of the games hosted on the IQeon platform. Open API and smart contracts technology revolutionize the world of online betting. Bets placed on IQeon could be on the results of competitions run on the platform or any other game existing on the Internet. IQeon is an already working product and one of the first games to be placed there is IQClash Lite. The game is based on the Blockchain technology and covers sessions of intellectual mini-quests where the players compete with each other. Investment specialists and Blockchain professionals rate the startup quite high. ICORating gave the project low-risk investment score. ICOBazaar and ICOBench rated the project 4.5 out of 5 and ICORanker — 78 out of 100. Not only rating platforms notice the high quality of the platform technical side and the robust business goals set by the management team but also various business insiders and investors at the conferences the IQeon team frequently visits. Among the recent conferences and Blockchain forums visited by the project, representatives are London Blockchain Week 2018, Blockchain Conference in Thai, World Blockchain Summit, etc. As the result of active participation, YouTube bloggers and British Cryptonews channels conducted interviews where IQeon benefits and the plans for the future are highlighted. The platform also obtained new partners that are eager to place their apps and games in the IQeon ecosystem. January 30, 2018, the main tokens offer started and it lasts until March 13, 2018. The schedule of bonuses introduced differs depending on what week of ICO you would like to invest in IQeon startup. It means that if you make up your mind to buy IQN earlier, the bonus is bigger. 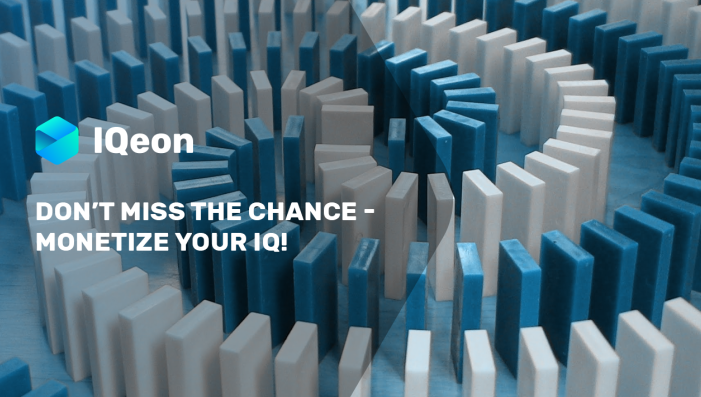 Don’t miss your chance and become one of IQeon early investors. To get more details, please, visit IQeon official website.